Meghalaya swearing-in ceremony: National Peoples' Party leader Conrad Sangma is going to be sworn in as Meghalaya Chief Minister today. A number of regional parties with the support of the Bharatiya Janata Party (BJP) outsmarted the Congress, which had emerged as the single largest party in recently concluded polls in the race for government formation in Meghalaya. 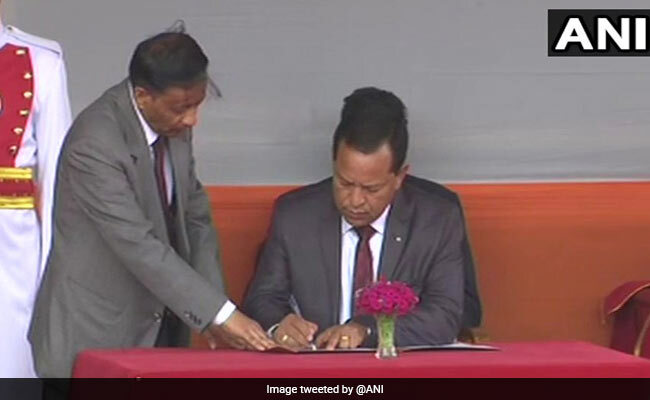 Conrad Sangma was sworn in as the 12th Chief Minister of Meghalaya today. 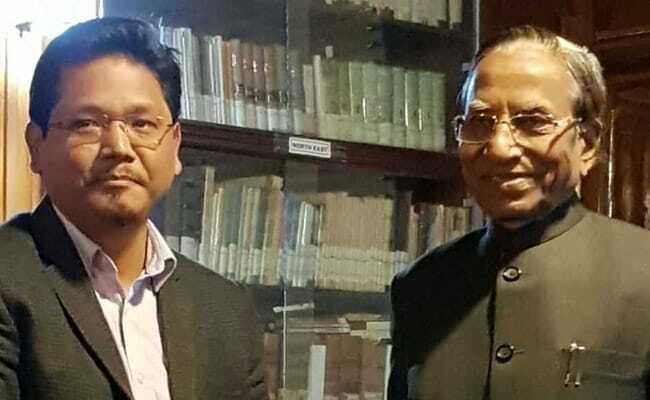 New Delhi: Conrad Sangma, Chief of the National People's Party was sworn-in as the next Chief Minister of Meghalaya. He will not have a deputy, BJP leader Himanta Biswa Sarma announced after Mr Sangma staked claim to form government and received an invite. The Congress, which has been in power in the state for the last 10 years was not able to stitch a coalition in time despite emerging as the single largest party. Union Home Minister Rajnath Singh and BJP President Amit Shah arrived in Meghalaya today to participate in the swearing-in ceremony of the National People's Party (NPP)-led government in the state, Assam BJP leaders said on Monday. Meghalaya threw up a fractured mandate on Saturday with the ruling Congress emerging as the largest party, marginally ahead of its rival, the NPP, an ally of the BJP at the centre and in Manipur. 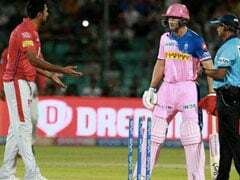 The Congress won 21 seats in the 60-member Assembly, making it the single-largest party, but it was 10 seats short of an absolute majority. A Lok Sabha member from Tura parliamentary constituency, Mr Sangma was the state's youngest Finance Minister in 2008 and was later leader of the opposition in the assembly. 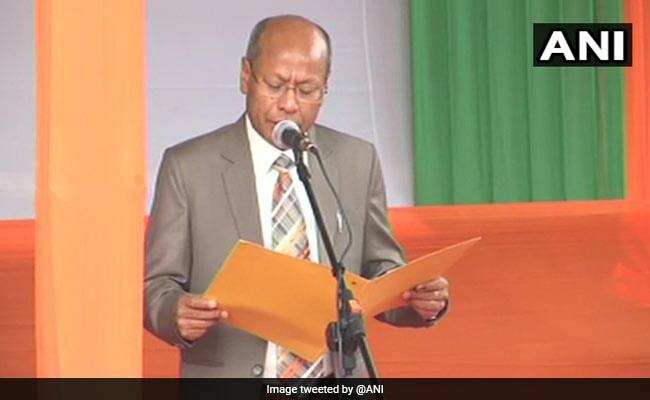 Rajnath Singh also took to Twitter and congratulated Conrad Sangma after he took oath as the 12th Chief Minister of Meghalaya. Congratulations and my best wishes to Shri Conrad Sangma on being sworn-in as the Chief Minister of Meghalaya. I am confident that he and his team of ministers will put the state back on a development track. The National People's Party (NPP) congratulates Conrad Sangma on becoming the Chief Minister of Meghalaya on twitter. 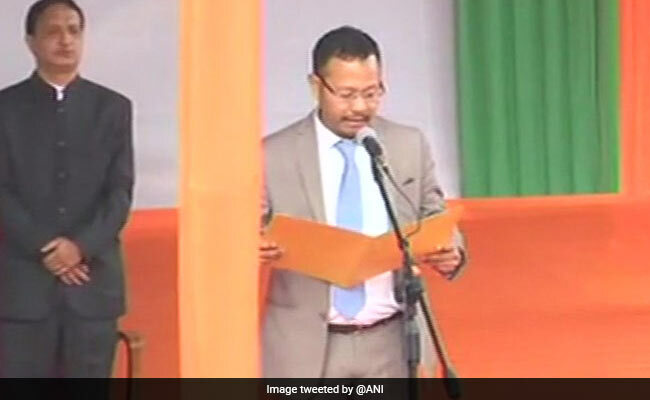 Visuals of Council of Ministers being sworn-in at oath ceremony in Meghalaya's Shillong. Eleven other ministers also took oath this morning. Sarbananda Sonowal, Chief Minister of Assam says, "We will walk together for our growth. Now it is Congress Mukt bharat. There is no scope for congress now." 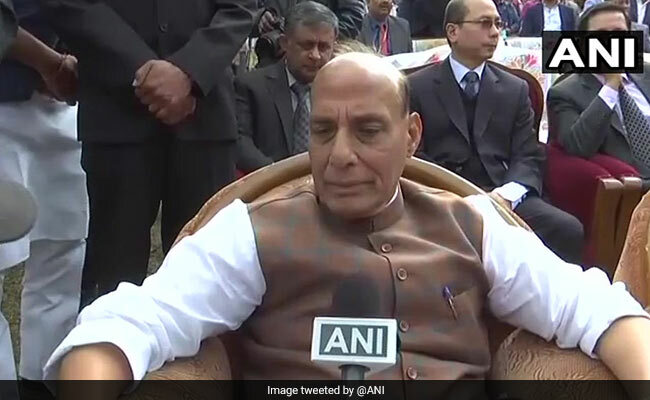 Union Home Minister Rajnath Singh says that, I want to congratulate him. Earlier it was a perception in the country that only congress can only survive.But the recent victory in NE has changed this perception.It is no less than a grand victory." 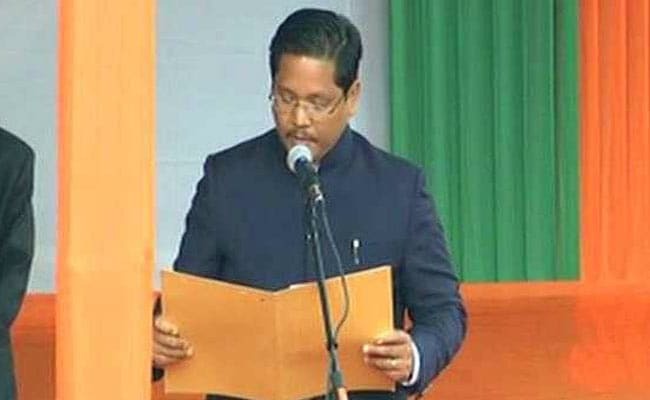 Conrad Sangma takes oath as the 12th chief minister of Meghalaya. 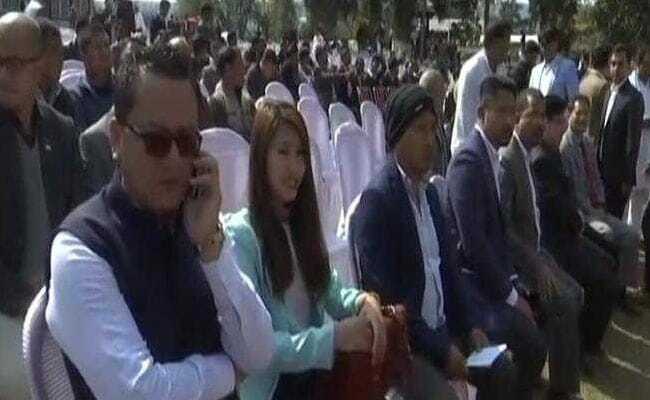 The swearing-in ceremony of Meghalaya Chief Minister elect Conrad Sangma and other's begins in Shillong. Union Home Minister Rajnath Singh and BJP President Amit Shah arrive for the swearing-in ceremony of the National People's Party (NPP)-led government in Meghalaya. Visuals of preparations for the oath taking ceremony of Conrad Sangma from Meghalaya. Conrad Sangma is the youngest son of former Lok Sabha speaker P.A. Sangma and took over the reins of the party after his father's death in 2016.